We finally decided to stop talking and get on with a drive to New York and an exploration of various places. We were on a lark and a dream. Some of them came true and some were just plain awful. However, through it all we persevered and saw so many wonderful things in various weather conditions. It was an adventure and we loved all of it…from the good to the bad. We stayed at a B&B in Grandfalls called the “Carriage House Inn”. One of Chris’ favourite places to stay when he was on the road to Corner Brook a few years back. The owners make wonderful breakfasts but it’s a fixed menu one choice only. We had the french toast which was perfect. Loved it and good coffee too. Here we are starting out. We drove across the Province of Newfoundland to reach Port Aux Basque in order to catch the ferry crossing. A moose came onto the highway to wish us an adventurous vacation. We turned of the beaten path before we reached our destination. We saw such tiny communities tucked away from the rush of life. Someone built a “Tiny House”. We arrived in Port Aux Basque early and was able to have a tour of the area. The roads are twisty turny and houses are perched vicariously on land full of rocks and boulders. This wonderful community has produced some very good people over the decades. I’ve met many. Waiting patiently for us to board the ferry. Yes, of course it’s raining. We were tired from the drive and went to bed as soon as we had a tour of the place and found our bearings. Simple to say, the ship was great, and I slept well. The rocking motion was so nice. Once we got off the ferry in Nova Scotia, we needed breakfast and found a place called the “Yellow Cello Cafe”. Yes, there was a lot of yellow everywhere. Loved the food and we had a very nice place near the window. It was so nice. We also visited the Alexander Graham Bell Museum. What a wonderful place. Well designed and full of information about A.G. Bell. His family, life, inventions, models, history, such a good read. We arrived in Fredricton and stayed the night at yet another “Carriage House Inn”. This one was a huge two story house with wonderful architecture, antique furniture, and the sweetest hostess in the world. We met a couple from Australia and ended up having breakfast with them. What a nice surprise. They were retired and making a point of seeing the world at their leisure. We had no trouble at the border and really enjoyed the foliage along the highways in Main. The trees are immediately much larger than ours could ever grow. It rained and we had a variety of RDF (Rain, Drizzle, Fog). So we were a little discouraged since we were also on the hunt for sun. We did have a side trip. 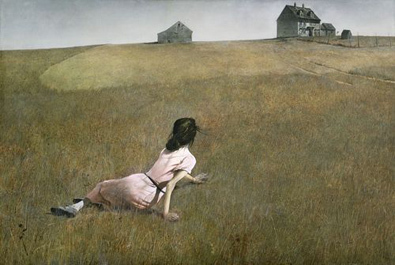 I saw that there was an exhibition of Andrew Wyeth’s work and this particular artist has been an icon for me in my youth. We managed to get to Rockland, Maine where the Farnsworth Art Museum had sketches, plans and watercolours of his work. The exhibition was all about his process in building up the final works that he is so well known for. It was a very interesting exhibition. We had to rush through the exhibition since we arrived late and had just about 50 minutes before closure. We forgot to take pictures…dang! When we finished, it was just starting to rain and we were so very hungry. We had gone to Whole Foods in Portland and had sandwich fixings in the cooler. We had our very late lunch in the car. By the time we reached Portland the rain was coming down hard and steady. It was so very late and we still didn’t have a place to rest our weary selves. We still did not have supper so we stoped at Ruby Tuesdays. Chris went to buy a bottle of wine and he was drenched to the bone. He just gave up avoiding huge puddles. We were tired, wet and hungry. However, we tried to keep up our spirits. We woke up refreshed and ready for another day. I started out the day with not finding my cane..uh oh…left it at Whole Foods. We called and….yep..it was there. Oh, Joy..we then packed up and headed towards Whole Foods. Success on the cane issue. We thought we’d go see Salem since we were in the neck of the woods. Our next stop on our adventure. Well, needless to say it was stressful. Our GPS kept driving us into insane traffic. We were frustrated, since we ended up spending the whole day in the car. Ewwww! !We made it to Salem late, frustrated, tired and cranky. We checked into an express inn. It was just that…just a place to sleep. Great for business men on the run. Great for tired, grumpy old farts too. We had to go over to the restaurant next door where we purchased a bottle of wine along with some bread, olive oil and balsamic vinegar. The waitress was so sweet and understanding. We drank the wine and went to bed. Too tired for supper and no mood to eat it. The next day Chris wanted to leave Salem right off the bat. I stood my ground. If we went through all the trouble to get here I’d be damned if I wasn’t going to see the place before we left. I’m glad we went. At first we saw a lot of touristy things and gimmicky places playing on the Witch Trials. The Witch Trials were just a short few weeks in the summer of 1692 where the towns people executed 20 people for supposedly practicing witchcraft. This small space in time has held Salem in an eternal memory of the event. The town has created an area next to the cemetery that contains a square area that has 20 slabs cantilevered out of a stone wall with the names of each individual that was executed. Such a sad thing to have happened. To my surprise they also had a small crafts square where I purchased a some silk embroidery thread and a ceramic bowl with a chicken head on it. I fell in love with it. We managed to walk a fair distance around the area but it was soon time to get on the road once again and head out of Salem. Oh my gosh, we had no idea what hell we were about to enter. Once again the GPS headed us to northern Boston…yes…it was nuts in traffic and we were stuck in Boston for over two hours going no where. I was sooooo stressed again, and just wanted it all to go away. How do people live like this?? In their cars for hours and hours each and every day. I just can’t imagine it. We arrived in New Haven to the worst hotel so far. Oh boy was it horrible. I will be doing a full account of our accommodations on Trip Advisor. We should have been clued in when the young girl at the reception was complaining about mould around the bath tub in her room. That’s not all that was wrong with the place. The dang shower safety handle was mounted on the wrong side of the tub. Over the toilet….WHAT???? Anyone using this device would have to step out onto the toilet to get out of the tub. Someone must have been really screwed up the day it was put in. However, the bright side was that there was an IKEA store within walking distance of the hotel and so very close to the parking area where we were storing the car for our train trip to New York. Whooo Hooo. I stopped by on our way back and bought two very nice duvet covers. One for us and one for Jane. That’s it…I was in control!!! In New Haven we parked our car in a secure parking garage and headed for the train to take us to New York. We arrived at Grand Central Station. The place was buzzing with activity. Above our heads were unique architectural features that were so beautiful. I’m so impressed with New York for understanding the value of old traditional architecture. We walked a very short distance to the Roosevelt Hotel. My folks stayed here when I was three months old. Mom was fascinated by the fact that people were still up and walking around New York so late in the evenings. She was from Portugal Cove which was such a small place at the time. There was no such thing as a sky scraper in her town. At once, we headed towards Times Square. Boy did we get entertained. We witnessed an Art Happening. Volunteers stripping naked and painting themselves. Regular, ordinary people letting it all hang out amongst hundreds and hundreds of by standers. I could never do that in a million years. Nope!!! Brave on them who ventured forth to bare it all. We also saw a wonderful piano player on the public decorated piano for anyone to use at anytime. He was so good, I could have listened to him all day. There was also a violin player there as well, she was playing Pop Music, very well done. Then there were the police. Currently holding automatic assault rifles. I asked the boss if I could take a picture and he nodded discreetly..yes. We had a snack, relaxed and watched the show for a little while and then headed back to the Hotel. I’m always hunting for a good place to eat when we are in any new city. I found El Centro in “Hells kitchen” and it was awesome. The food was so very good and I really loved every bite. So did Chris. The place was packed, we were lucky to get there a little early and had a great seat on the side wall with benches. Service was incredible since the heat was enough to melt the best server. Drinks were good…food good…service great. We planned on going to the Guggenheim that evening after supper. This did not work out since it was a Special Saturday and they were offering “pay as you wish” tickets…soooo there was line up almost around the block to buy tickets which were on sale until closing time. We arrived way ahead of closing time and knew then it was a hopeless cause. Soooooo, off we ventured. We rambled along and saw the United Nations Building. We also saw Trump Tower…oh joy. We also had a beer at a small outside kiosk . That was really nice. We ended up here on Columbus Circle. The evening was nice as we ambled back to our hotel for the night. We rested to fortify us for another adventure. I was thrilled to discover that there was to be a huge Craft Fair at Lincoln Centre. We were there early, poor Chris had to wait for me to shop. He didn’t even have his book with him. However, he was warned and I circled the stalls. Thank goodness they were all covered. I made my choices and headed in. I was in heaven, so many beautiful, unique crafts. Some far above my price range but just as stunning. Some were, ok… However, 80% were of excellent quality and craftsmanship. Chris watched a graduation reception. Full of budding young students just waiting to sink their teeth into the future. Moms and Dads beaming and dressed to the “Nines” and all of them taking tons of pictures. On our way to catch a Taxi for the Ferry to the Statue of Liberty we crossed paths with a small gathering of Hare Krishnai. This was the float for the parade scheduled sometime in the day. There was also a huge National Puerto Rican Day Parade was going on all over the city, marking down 5th Avenue. We missed it….oops! Our main attraction for New York was the Statue of Liberty. The Statue was awesome and we had the most wonderful tour guide. He was really multi-talented. Here are her huge feet which are made of metal, poured from a wooden mould which was reversed. Each and every part was done this way. All in small sections. Also, there were several versions of her as well as several versions of the pedestal she’s currently standing on. All the sections were riveted together. The flame was replace in recent years and this one, in the shape of a teapot was the original flame. And then there’s the flame of my life standing in front of the Liberty Flame. Awwww!! The base is in the shape of a star. We’re on one of the corners of the star. Such a beautiful, clear day. The water was so calm, it’s almost at the glass stage on the surface. Oh, I must not forget that it’s seriously hot with temps in the 30’s. Chris finally found hot weather but didn’t bargain it being as hot as this. It could be worse and be in the 40’s…rolling eyes and thanking the universe that it didn’t happen. Here we can see the stairs that every person walked down at Ellis Island. There were three ways in which you left the island. One stairway took you back home. According to our guide, this was done rarely and only if the persons were a threat to the country. The second was to go to the hospital, which was walking distance from the exit. This hospital kept emigrants here for treatment of whatever situation they may have had. Most were able to recover from their ailments and walked to freedom in good health. The third staircase was freedom, they descended down the stairs and out into a new future in the U.S.
On our way back we decided to take the subway back to our hotel. Another adventure waiting to happen. We remembered the partial structure being constructed of a dome for the new subway station. Kind of a main hub in one space. This space is not fully up and running. We had two days at the park. The first day was so very hot and on a Saturday. Everyone and their dog was out on the grass. Such a great day if it had just been a little cooler. We stopped off to cool ourselves at the entrance of “Tavern on the Green”. A mix of people going in and out. Most upper middle class and climbing. Sitting on a bench was a woman who didn’t have a care in the world. She was homeless but really should have been in a home or care facility since she was having a full conversation with herself the whole time. It was very sad to see. My heart lead me to give her a few dollars. We finally managed to get back to the Guggenheim. The first attempt was around 7:00 p.m. Saturday evening. Not a good time…really. Apparently the last Saturday of each month tickets go on sale for a short time. The line up was almost around the block. Early morning was our next try and it worked out very well. i think we were one of the first and not a line up in sight. Alexander Calder was the first thing I saw coming into the structure. i fell in love with the building immediately. No stairs!!! OH, MY GOSH!!! Soooo, I took the elevator to the top floor and had a leisurely walk around the exhibits, alcoves and all, and just let it all absorb into me. Oh, my I was in such peace and joy here. We then walked to Central Park again. This time I was able to find a place quiet and peaceful so that I could do a little sketching. I managed to sketch a section of walkway and an old man asleep on the bench next to me. Various birds came to investigate what I was doing and hoping for a hand out. We said goodby to New York and I finally got to get a look at IKEA. I was in heaven but far too practical. Chris was a happy camper. We managed to make it to the “Largest Antique Shop” near Portland. I found six perfect Milk Glass parfait glasses and a round piano stool at very reasonable prices. We finally arrive in Portland to board the ferry to Yarmouth. We had some time so we did the touristy thing. As it happened there was a very nice market downtown. I was amazed at the variety of mushrooms available at this market. To tope it all off they were offering kits so that you could home grow all these varieties. They said they will be going on line soon for orders. I hope I can buy a kit without hassle from customs. Here we are in Portland once again. We had a wonderful sail to Yarmouth which is about 6 hours. The ship is a catamaran and it really goes through the water so smoothly. The ship is clean, well maintained and the service is top notch. We arrived in Yarmouth only to be delayed quite a long time going through customs. We weren’t out until 10:30 p.m. We managed to find a nice hotel and settled in for the night. Our next stop was Digby. I was on the hunt for Maude Lewis’s original home which was really a replica of her home. Her real home was reconstructed in the Museum in Halifax. The home that now stands on the property is steel and is the exact dimensions or the original. The Province did a very nice job of commemorating this site. I was touched. Here is Maude, happy to have her picture taken. She was an amazing woman to persevere in such difficult conditions along with the arthritis she suffered her entire life. She was an eternal spirit. Maude’s and Everett’s little house was so very small with just tiny attic for a bedroom. No running water, electricity or heat. Only a wood burning stove, a small kitchen, a table. But Maude made this little house a home full of colour, and cheer. She was unstoppable. We’re in Annapolis Royal. I was determined to get to this place since my hero, Debbie Kuzyk was there and I had to see her. This woman has a ton of talent and I love her work. Her husband is retired now but they are turning their home into an artist co-op and moving out of town to enjoy a more country setting. I was able to purchase some of her tiles. Yeaaa!!!!! We explored Annapolis Royal and purchased a few things that were unique. Here’s Chris in Lunenburg which turned out to be a very interesting place. There were so many galleries here. It’s a wonder they all survive. There were a few antique stores and there were so many things I would have loved to have bought. Especially a small hall table. There were three that I saw that would have been perfect. Dang. We also had a wonderful lunch here and I purchased a great tote bag with cats on it. Of course. We ventured on to Bridgewater where we met up with Loyd and Anne Parks. Both Loyd and Chris have been best buds since Fredericton and have kept in touch all these years. They both worked at the bank there and had a great time being bachelors. We had a wonderful dinner with them. However, we were so engrossed in conversation that we totally forgot to take pictures. Dang it! After Bridgewater, we were off to Touro. We were trying to get a hold of friends we met in Jamaica but we drove too far and would have had to back track to see them. I’m sorry we missed them. We stayed in Touro just to get some rest and found out that they had a Farmers Market the next day. Of course we went. It was great. I do hope that one day we will have such a great space for a Farmer Market in St. John’s. I dearly wanted to buy those tomato plants. They were so cheap. Alas, I could not bring them back to NFLD. Rat! However, when I got home I was in for a big surprise. Yeaaaa!!! We were done with Touro and slowly went on our way to the Nova Scotia Ferry. Wanting to get home and yet not wanting to end the adventure. Mixed feelings for me. We found an ho-hum cheap hotel. I wasn’t impressed. We then went off to explore the area. A deal was a deal and we went to the Casino. It was quiet since we were there in the afternoon. I had lunch, a salad, that I couldn’t finish and I found a place to watch. Did a quick sketch of two women on the one arm bandits. I tried a whole five bucks, it was like watching paint peel. I just wanted to get it over and wanted to lose quick and get out of it. That was the easy part. The next day was Father’s Day so we all agreed to celebrate the following weekend at home. We did and we had a great time. However, I could’t let it go so I offered to drive up the coast of Cape Breton Island, Cabot Trail while he could read or relax. We were heading towards a nice breakfast at the “Clucking Hen”. They weren’t kidding. Sooooo, many figurines of chickens and great chicken jokes too. Loved the food and the atmosphere. We then explored a beautiful glass studio and had a great chat with the owner. She has been in business for 20 years and built her studio reputation by word of mouth. Glass artists come from all over Canada to spend time at her studio to explore and produce some pieces for her shop. There was a young French Glass Blower to visit and his work stands out so much…very European, while a mosaic Newfoundland Artist comes to create with pieces of glass to build landscapes with glass. I was mesmerized, there were so many beautiful forms. I finally chose a hand blown wine glass all opaque white with small pieces of coloured glass scattered throughout. I loved the unique use of the white glass. We left there and headed towards Englishtown where we caught the shortest ferry ride in the world, I think. It may have taken 5 minute to cross. Tooooo funny. Here is the peninsula where we went to catch the ferry. We’re done here and head towards Sydney. By the time we got back it was time to check in to the NFLD Ferry. We took the Argentia Ferry since we knew we would be sick of driving and it would have been torture to have to dive across the island aaaaaagaaaain…ugh! It was a trip in heaven. We met two great guys with long grey hair, piercings, and tats. On their way to St. John’s to met up with friends. They were also at Annapolis Royal the same time we were. There was also two great singers, guitar and accordion players for our entertainment. They were great and knew every song in the book across NFLD in addition to the book they had on Country Music. We stayed up for a while and enjoyed the show and one of them “Kevin” came over to our table and had a ton of stories of his life to tell. We loved meeting him. After a long and eventful two weeks we were heading home. It was so nice to walk through our own door and hug our daughter. She did an awesome job taking care of our place while we were gone. God love her.